What is your relationship to The Dance? As I transition to my Fellowship Practicum assignment in Boston, MA, I have tried to take some time to reflect on the six beautiful weeks I spent working at Jacob’s Pillow, attending dance performances, and connecting to so many talented and interesting people with different backgrounds and personalities. This question keeps coming to my mind: What is my relationship to the dance? I’m not a professional dancer, I’m just a dance archivist – how important is that in the big scheme of things? Everyone who contributes to the Jacob’s Pillow Dance Festival — as a staff member, scholar, intern, student, company member, or archives fellow — has a different story about how they became involved in the dance world, or where they hope to go in the future. And yet each person is just as important as the next, because it takes all of us doing our individual part to make the Festival a success, just as a dance company relies on each member to contribute their unique strengths for a successful performance. There is more to the dance than dancers and choreographers alone — the dance is rich, and encompasses an equally rich and diverse population. Coincidentally, this topic was explored recently in the NY Times, where professionals like Christopher Duggan, Photographer in Residence at Jacob’s Pillow, shared their story of how and why they chose to apply their trade in the dance world. I can’t do what a dancer does, and most dancers would be lost in the Archives — but a dancer and an archivist working together can make some real magic happen. At Jacob’s Pillow, my professional and personal relationship to the dance has been extremely well fed through the variety of programs and performances I have been able to enjoy (see my last post: Scholarship at the Pillow), and also because of the relationships that were nurtured through shared activities and serendipitous opportunities to learn from one another. My time there was wonderful in every aspect — I cannot express the depth of my appreciation for all of the gifted people I have met and worked with, especially for my project supervisor, Norton Owen. In every way, my passion and commitment to work in dance archives and collections and to give back to the dance has been strengthened and refreshed. I look forward to a similarly positive and rewarding experience from my Practicum assignment, but I will never forget this summer at Jacob’s Pillow! My colleague Hadley Davis made some great points about the challenges of both creating and sustaining public awareness and appreciation for dance history and criticism in her blog post, “Difficulties for Dance Librarianship.” Dance itself is a transient, ephemeral art, so how does one go about studying dance? How does one talk about dance, or even understand dance? 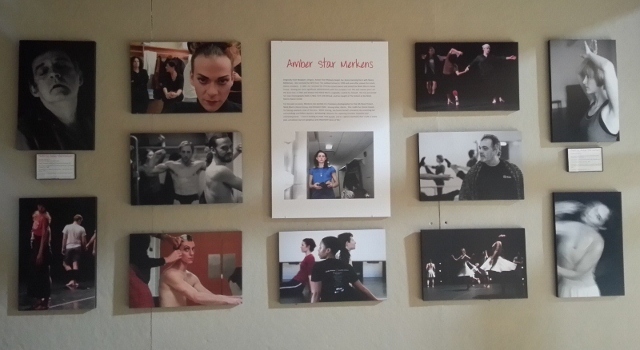 At Jacob’s Pillow, in addition to the fabulous dance performances put on during the festival, each week there are many historical and educational programs on the schedule that are free and open to the public. I have been so impressed by the quality of all the programs that I’ve attended — and I also believe that collectively they have been hugely beneficial in my dance history education — that I feel it’s important to share a few samples of these programs here, and remark how the scholarly efforts at Jacob’s Pillow add some intellectual spice to the experience of coming out to enjoy dance, making dance more easily accessible for everyone. First there are the Pre-Show Talks, which are given for each performance in the Ted Shawn Theatre and the Doris Duke Theatre. In these talks, one of the Scholars prepares a 10-15 minute “appetizer” for patrons that covers some of the background of the company that the patrons are about to see. The scholars also dissect each of the pieces listed in the program for that evening, and give some ideas about what to look for during the performance. These Pre-Show Talks are a great way to set the stage for the audience so they will be able to maximize their experience of the dancers on stage. Then once a week directly after the show, there are Post-Show talks, which take place in the Ted Shawn Theatre or the Doris Duke Theatre. These talks are a chance for the audience to hear one of the Scholars interview the company Director, or other members of the company they’ve just seen perform, to learn more about their inspirations and the ideas behind the performance. After this the audience can then ask additional questions and participate in the dialogue. Here’s the video clip of the Post Show Talk that took place between Brian Brooks, founder of the Brian Brooks Moving Company, and Scholar in Residence Maura Keefe. 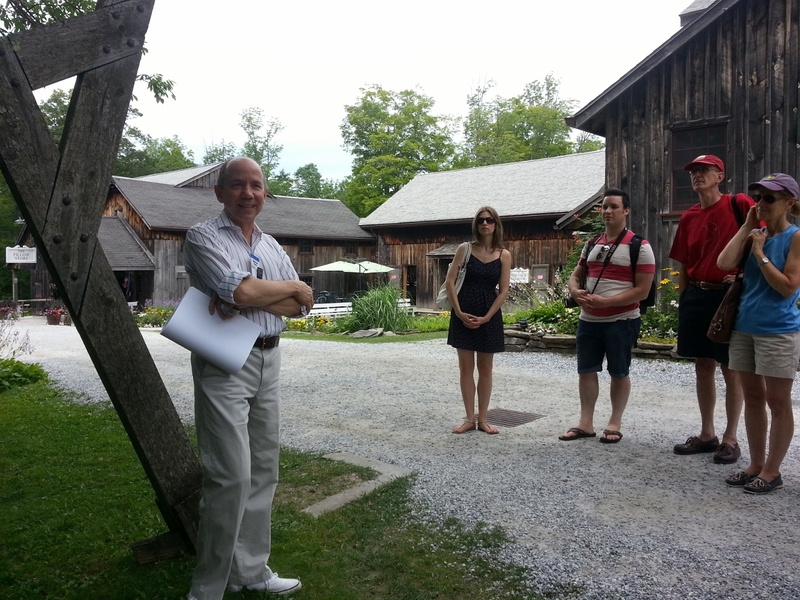 In addition to these talks, there are historical tours of the Jacob’s Pillow grounds and film showings that take place throughout the summer, so there really are learning opportunities available for patrons and staff at every turn. 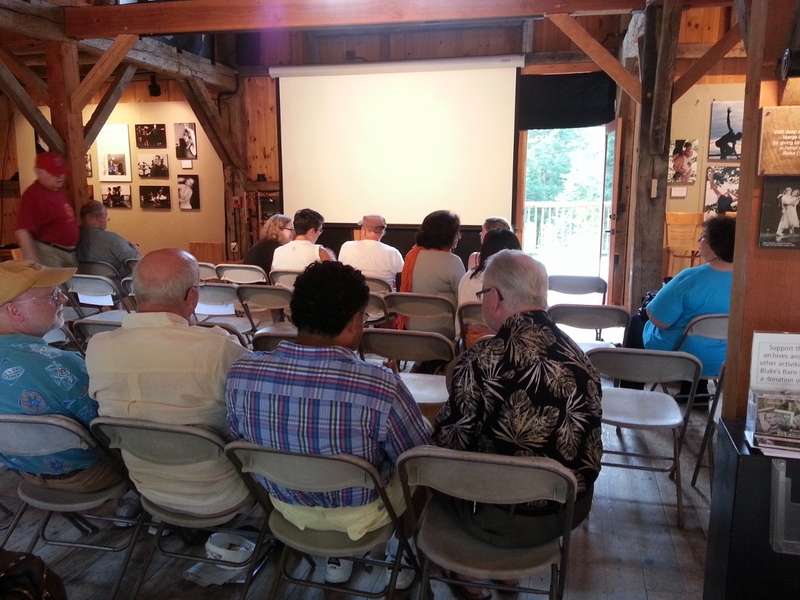 Blake’s Barn occasionally turns into “Blake’s Cinema” for film showings. Norton Owen giving a tour of the grounds that focused on the history of the Ted Shawn’s Men Dancers, who built many of the structures on campus by hand during the 1930’s in-between rehearsing and their performance tours. Of course there are also many online tools and websites that allow anyone to learn about dance online from their homes. I’ve mentioned “Dance Interactive” in previous posts, which is a searchable collection of video clips from the archives, and an immensely useful resource. Additionally, the Jacob’s Pillow YouTube channel is full of snippets of talks like the ones I have posted above, but there are also many promotional videos that are developed throughout the season that spotlight a certain dancer or company with biographical information and clips of their work. I think these types of resources truly help solidify dance as a viable art form, and I also think they enhance both the public response to dance and the awareness of dance as a meaningful part of our culture. Kudos to Jacob’s Pillow for providing these high quality programs! The last post was about Project One, so this post shifts the focus to Project Two. Along with developing the test web exhibit, I also tried to find a good technological match for working with the existing data from the Archives database and making it ready for the web. Many years of collaborative efforts have been invested in creating over 7,500 records within the existing Archives database, so we absolutely didn’t want to lose any of that work in the transition. But the existing database did not have a “front end,” or a “public side” that would allow that data to be accessible through the web, so the goal was to find a way to export or transfer that data into a program that would display it online in a way that would be intuitive for public use, and conducive to research at many different skill levels. My research for this project, as in the first, pointed me in the direction of Omeka because Omeka has import features that are compatible with the export settings of the existing Archives database. After a few trials and experiments, conferences with Norton, and the assistance of Gerry Kavanaugh, the Information Technology Manager at Jacob’s Pillow, we were able to determine that Omeka was a viable solution worth continuing to explore. Here is the homepage of the Omeka site that we came up with to showcase the Archives exhibits, and to allow access to a searchable database of files that describe the contents of the physical archives and video collection housed in Blake’s Barn. The site is still in development and may look a bit different when it goes live, but this image gives an idea of the basic Omeka theme we worked with and modified slightly to match the institution’s vision. 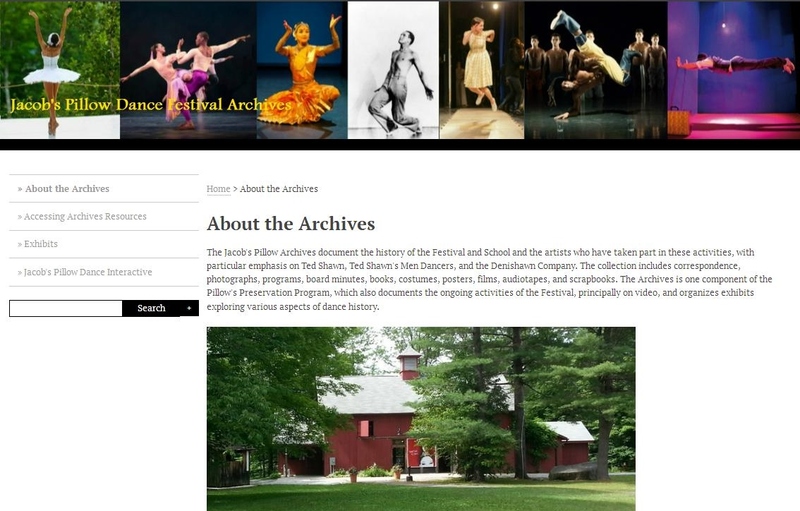 The homepage gives some basic info about the Archives, and the left sidebar provides links to a reference page for using the search features, the exhibits page, and a page promoting Jacob’s Pillow Dance Interactive, a fantastic site with clips from the video archives. When users click in the search box to look up a dancer, choreographer, or dance company, etc., the site returns a list of the titles of videos or documents that match the search. Then the user can click on a title and learn more about that item, in the same way people use library catalogs or an internet search engine. Clicking on an item reveals the full summary, and other important details about that item, as pictured below. Another Omeka feature that we implemented allows users to click on the name of a choreographer and retrieve a list of everything in the database that s/he choreographed. This feature also works with the names of dancers, participants, videographers, or event titles (“Pillow Talk,” etc.). This facilitates browsing and further investigation of the online database by users in ways that have come to be accepted, and even expected by the general public. It is quite interesting and fun to explore! When both projects were near completion, I had a chance to present the site and its features to the Archives department at our weekly meeting. Presenting on the Sommerspace deck, with Ben Richards on the left. Pictured (L to R): with Kathleen Dalton, Nel Shelby, Maura Keefe, and Ben Richards. I was a little nervous during this presentation and can’t remember a single thing I said — haha! — but I’m told there were no embarrassing moments, just a nice, informative conversation about what I had been busy working on for six weeks up in the hayloft. Norton asked me to repeat this presentation the next day during part of a Senior Staff meeting, which was a great learning experience and helped me refine my presentation skills. What did I learn from this project? Much of the work was tedious — examining lines of data, scouring files of Omeka code, attempting to write PHP modifications with varying levels of success — and all this without air conditioning in a hayloft workspace during a hot Berkshires summer. Considering this, it seemed crystal clear going into the project that either I had the patience and passion needed to be a digitial archivist specializing in dance and could complete the project with my sanity intact, or I was way off my game and should never have left Texas! In my first meetings with my supervisor, Norton Owen, I learned about the two main projects he had in mind for me to work on, with the possibility of more as time permitted. The first project would involve photo exhibits that had been on display in Blake’s Barn and a few other locations around campus during summers past. Up to this point, the only way to have seen these exhibits was to come to Jacob’s Pillow that summer for a visit. Norton was looking for a way to re-create past exhibits for the web, so that more people could enjoy the photographs and archival materials and learn more about the dance history of the institution at the same time. The second project involved taking the finding aids and database files that had been created and maintained on the administrative side of the archives, and putting them into a searchable web format that can be made available to the public. I’ll go into more detail about that project in the next post. The technological solutions for these projects did not have to come from the same programs or software, however after some careful research and investigation, some trials, and feedback from my supervisor, I eventually found a tool that seemed perfect for both projects: Omeka. Many libraries and archives use Omeka to create digital exhibits, digital collections, and to make their resources available online. Omeka is also open-source, just about infinitely adaptable, and free. With the go-ahead from Norton, I began to work with Omeka, problem-solving for the second project as I got started with the first project, the web exhibit. 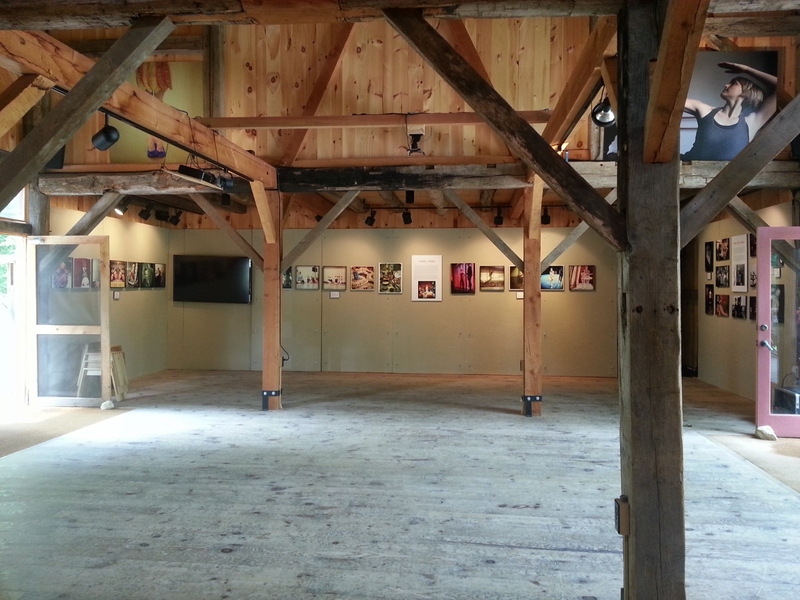 Here is a picture of the exhibit space in Blake’s Barn, and an example of what one of the current photo exhibits looks like. The online layout of any web exhibits would need to be as flexible as the layouts Norton has designed for the physical exhibits, and offer the same freedom for exhibit curation that the smooth flat walls of Blake’s Barn currently offer. 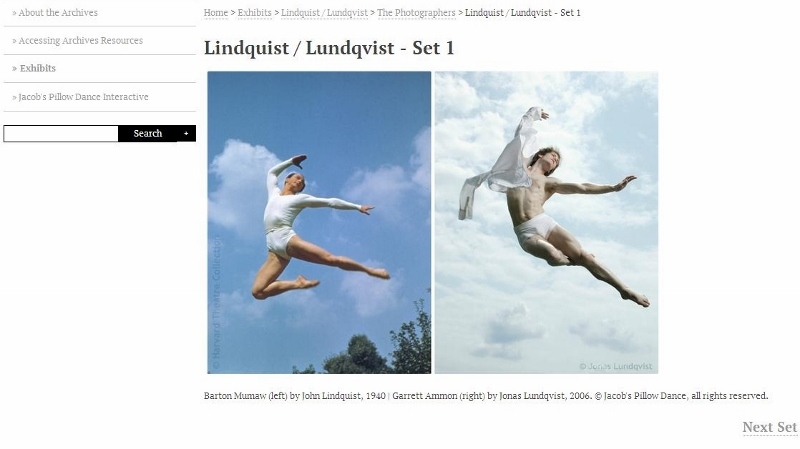 The exhibit Norton wanted to use for the “test” exhibit is called “Lindquist / Lundqvist.” It is a photography comparison between John Lindquist, resident photographer at the Pillow from the 1930’s to 1980, and Jonas Lundqvist, a contemporary dancer and photographer who created a body of photographic work for the Trey McIntyre Project in 2006. These two men never met, and yet they both produced surprisingly similar photographic compositions. The similarity of their names is also a coincidence! It’s so exciting to see their work side by side. The web exhibit links 10 sets of photographs like these in a series, sized for the web and protected with watermarks. I had a great time working with the Lindquist / Lundqvist photographs and setting up the website pages to display them at their best. 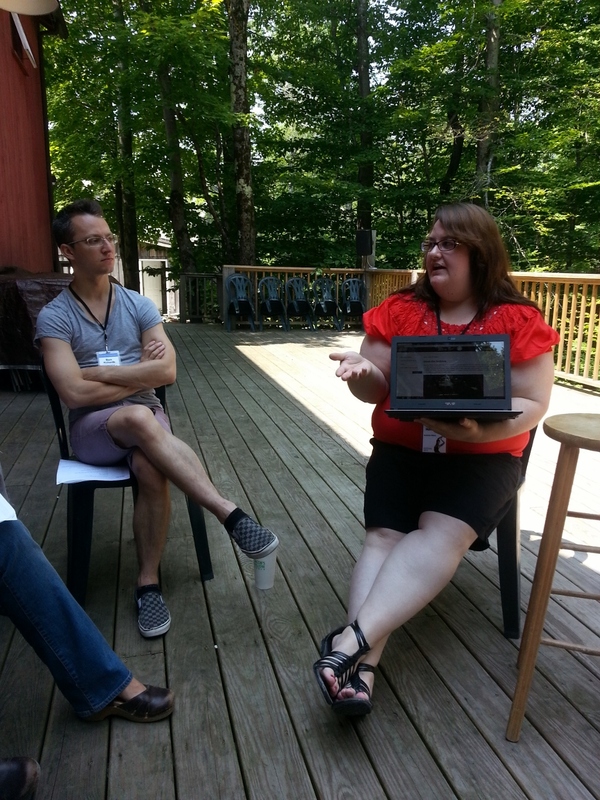 Keep reading to learn about the second project I worked on for the Jacob’s Pillow Archives! While I’ve mentioned in past posts that the Jacob’s Pillow Archives live in Blake’s Barn, I haven’t yet mentioned that the building has three levels, with exciting things happening on each. So please enjoy a brief tour of the different areas within Blake’s Barn, and the treasures that can be found throughout. The archive materials and video collection are housed in the basement level, which is also home to the Videography department. Click on any image for an expanded view and caption. The Videographers have several workstations like these. I love this assortment of cords and wires! My colleague Margaret Cherin works at this desk, which was Ted Shawn’s. She is processing an archival collection under his watchful eye. The documents and correspondence items are stored in these archival boxes. These are the film canisters. Here are some VHS access copies for use in the reading room. The access copies for newer videos are in DVD or Blu Ray formats. Blu Ray discs are in Blue cases. Here is a framed newsprint feature on the Ted Shawn’s Men Dancers. The archives also have many objects stored and displayed from time to time. This is a headdress worn by Ted Shawn. At the main level there is the large, open space where the photography exhibits can be viewed, connected to the Sommerspace deck where Pre-show talks and Pillow Talks take place. The main level is also where the reading room is located, where patrons can come to look at books on dance, and can see videos from the collection at the viewing stations. Click on any image for an expanded view and caption. The reading room has tons of books, and stations where patrons can view videos from the collection. In 2003 Jacob’s Pillow was designated a National Historic Landmark. This is the original plaque, which the National Park Service replaced due to a typo. These are two of the viewing stations available to patrons. Here is President Obama presenting the Pillow’s National Medal of Arts to Executive and Artistic Director Ella Baff. This beautiful poster of Ted Shawn dancing is seen behind a kiosk for accessing Dance Interactive video content. This open space is perfect for exhibits! The reading room is through the door at the center. The opposite side of the reading room has a TV monitor that plays an informational video for patrons. 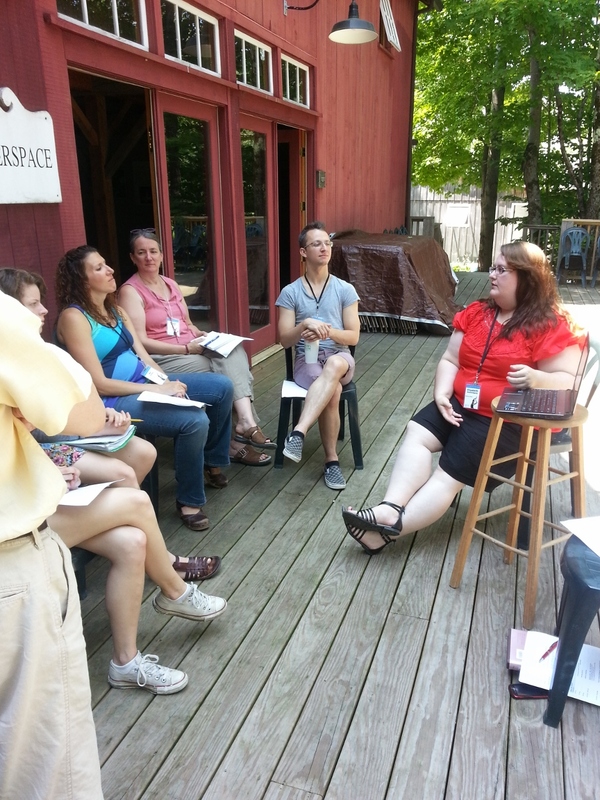 This is a pre-show talk gathering on the deck in back of Blake’s Barn, called Sommerspace. The third level is the “hayloft” where the Scholars-in-Residence and the Photographer-in-Residence have desks and workspaces, and I have been lucky enough to work alongside them during my stay this summer. It has been a great pleasure to soak up as much of their knowledge as possible. The hayloft door is open, so someone is busy working inside! We take this beautiful (but narrow!) staircase up to the loft. My workspace is on this side of the loft, right under the picture of Joseph Pilates. The view of lovely landscaping down below. In my next post I will be able to give an overview of the projects I’ve been working on in collaboration with my supervisor, Norton Owen. Stay tuned! As I have been getting settled at Jacob’s Pillow and wading into the bubbling stream of activity — figuring out the best times to get meals in the cafeteria or to make the drive into nearby Lee to do laundry — I have also been reading up on Pillow history to get a sense of this certain place as an institution and landmark. In the reading room of the Archives, I found a wonderful history of the Pillow with the same title as this post — “A Certain Place,” written by none other than Norton Owen, Director of Preservation and my project supervisor here at Jacob’s Pillow. I have also found some interesting biographies of the historical figures of Jacob’s Pillow available in the Archives, including a few books about the founder Ted Shawn, and an autobiography of Barton Mumaw, principal dancer with the Ted Shawn’s Men Dancers and a longtime contributor to the success of the educational programs and the summer Festivals put on at the Pillow. Many of the buildings here have fascinating stories about their origins and construction, and it has been a personal delight to see and touch the famous Pillow rock, and spend an evening enjoying dance at its finest in the historic Ted Shawn Theatre, topped by architect Joseph Franz’s hand-cast Barton Mumaw weather vane. It is an incredible feeling to know that my work here will help preserve some of the Pillow’s history, and extend it into the future. From the main parking lot, you can see Blake’s Barn, home of the Archives. Many events happen in Blake’s Barn each week. Maura Keefe, one of the resident scholars, offering insight into the Dance Theatre of Harlem performance. These sign posts help visitors find their way through the picturesque, winding paths. Just past Blake’s Barn is an open seating area for picnics. The picnic area is next to the Welcome Center. The Welcome Center has great information for visitors. The central structure is the Ted Shawn Theatre, the first theatre in America designed specifically for dance. I find the hand-painted signs very beautiful. When this bell chimes, patrons know that the theatre has been opened, and they are welcome to enter and find their seats. Inside the Ted Shawn Theatre, eager crowds await the evening’s performance. A large-sized painting of Ted Shawn, seen on the left. It was painted by Albert Herter in 1925. Opposite Ted Shawn is a painting of Ruth St. Denis, also by Albert Herter, 1925.. The original, hand-hewn beams are still intact, and represent part of the theatre’s history. Connected to the Ted Shawn Theater is the famous Tea Garden, where the very first lectures and performances took place. The Bakalar studio can be seen just beyond this area. Visitors can enjoy the Tea Garden’s picnic area, shaded by these wide umbrellas. The Doris Duke Theatre is down the hill behind the Ted Shawn Theatre. The view is lovely, and there are a few picnic tables on the way. The patio seating area is perfect for pre-show talks given by the resident scholars. The staff takes great care with the landscaping around each and every building. Near the Ted Shawn Theatre is the Stone Cafeteria, with the original stone structure intact! This part of the cafeteria is called the “Nook,” and is open all day for hungry dancers needing a quick snack. The original stone walls and fireplace. Behind the cafeteria are picnic tables for use when the weather is nice. 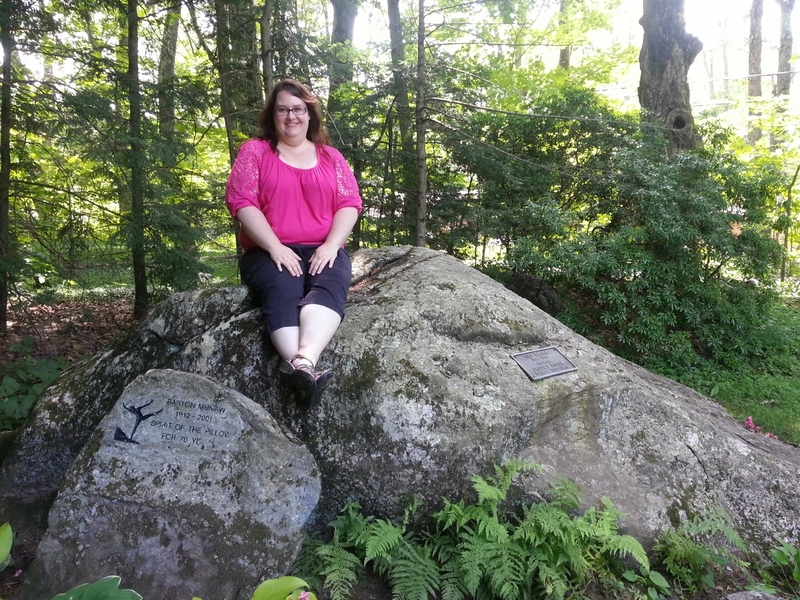 And also behind the cafeteria is the famous pillow-shaped rock that gave Jacob’s Pillow its name. In front of the cafeteria is a memorial to President John F. Kennedy. Next is Hunter House, one of the original farmhouse structures that dates back centuries! Follow the path down from Hunter House and reach the Inside/Out stage, where free programs are offered to the public. Jacob’s Pillow is surrounded by the beautiful Berkshires! The view is lovely even at night, when returning to the parking lot after the thrill of a fabulous performance. Coming into this new and fast-paced environment, I also set out to learn as much as possible about the organizational structure and workflow of the staff, and where my projects fit in with the other projects happening around me. It has been great to meet so many new people, and link arms together as I begin to tackle my archival tasks. (More on those soon!) The people here are just great, and it is amazing to see what we are already accomplishing together.